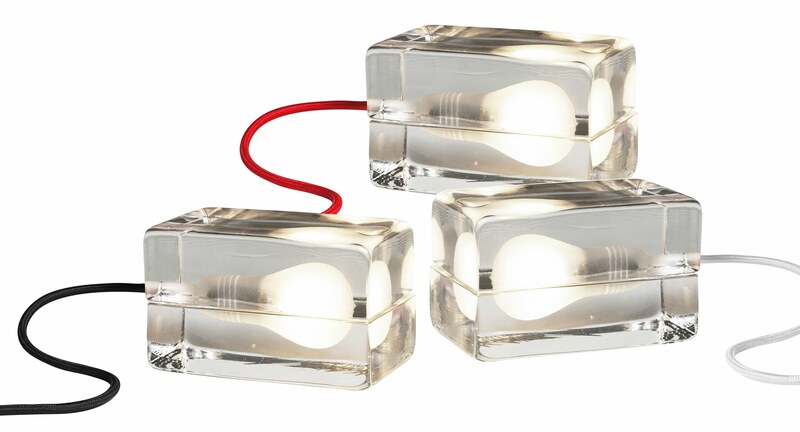 Glass Block Light Table Lamp with Encased Light Bulb by Harri Koskinen. We first spotted this gorgeous modern design glass block lamp in Sweden, and we’ve been fans of the innovative design ever since. Atop a desk, vanity or nightstand, our solid glass block lamp designed by Harri Koskinen highlights a room with crystal clear beauty. 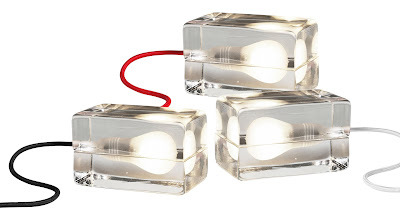 This glass block lamp bathes your room with light and sparkle. A design classic, this 10-year anniversary edition features an accent of color in the form of a new red woven cord. Inspired by industrial glass bricks, the bulb is encased between two heavy hand-cast glass blocks that can be placed on the floor or tabletop for ambient lighting. Add more style to any room with this modern crystal clear glass block table lamp. A unique accent for any room. Each part of the block lamp is hand cast and undergoes an extremely long cooling process to avoid cracking later on if exposed to strong temperature changes. The matte bulb shape is sand-blasted. In 2007, the Harri Koskinen Block Lamps were slightly modified to include three cord color options: White, Red and Black. This new design adds just the right amount of variation to the highly acclaimed and admired lamp design. A smaller sized block lamp and an amber colored one are the latest additions to the line.